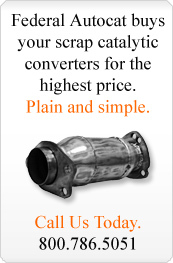 How much profit can I make from catalytic converters? That depends on how large the precious group metal (PGM) load. Rich at 1-800-786-5051, ext 103 can help you determine a method for learning the value based on type and count. What is the best way to sell our spent catalytic converters to Federal Autocat? Call for pricing, you'll be glad you did. Ask for Rich at 1-800-785-5051, ext 103. He will fill you in on how easy and profitable it is. However we are not interested in one's and two's, but catalytic converter collections. How is it Federal Autocat can pay top dollar to recycle catalytic converters? We have a proprietary measuring technique that consistently allows Federal Autocat to pay top dollar for spent PGM catalyst material. How does a catalytic converter reduce pollution? In chemistry, a catalyst is a substance that causes or accelerates a chemical reaction without itself being affected and can consist of a ceramic- or metallic-supported substrates coated with a precious group metal (PGM) catalyst, usually platinum, rhodium and/or palladium. The idea is to create a structure that exposes the maximum surface area of catalyst to an exhaust stream while minimizing the amount of catalyst content (PGMs) required to clean the air. What is a three-way catalytic converter? Most modern cars are equipped with three-way catalytic converters. This refers to the three regulated emissions it helps to reduce. The reduction catalyst is the first stage of the catalytic converter. It uses platinum and rhodium to help reduce the NOx emissions.The oxidation catalyst is the second stage of the catalytic converter. It reduces the unburned hydrocarbons and carbon monoxide by burning (oxidizing) them over a platinum and palladium catalyst. The third stage of conversion is a control system that monitors the exhaust stream, and uses this information to control the fuel injection system. Do you recycle catalytic converters from trucks and buses? Yes, diesel particulate filters are valuable commodities once through their lifecycle and have PGM content that allows us to return larger cash payouts than for those from cars. We also recycle spent DPFs from heavy off-road farm equipment, as well as diesel emission control devices from trains and boats too. Does Federal Autocat grade and recycle industrial catalysts. How does that work? Catalysts at the base of smokestacks and anywhere heat/smoke is generated as a result of an engine are coated with precious metals. The coffee, pharmaceutical, food and power industries, for example, keep emissions in check with large square or round catalytic converters. Once diminished in their effectiveness we pay top dollar to haul those spent catalyst material away to recycle their contents. Our sister company Recycalytics handles industrial catalyst material. Contact Bruce at 1-800-786-5051 ext 135 for more information. Does Federal Autocat recycle diesel particulate filters (DPFs) from trucks and buses and do you pay top dollar for DPFs as well? Far too often thrown away as trash, the PGM values in DPFs allow us to return top dollar to fleet garages and fleet maintenance yards for spent DPFs. City managers of large municipal garages may find a surprisingly nice revenue stream here to help balance budgets as well. Our sister company Recycalytics handles DPF recycling. Contact Bruce at 1-800-786-5051 ext 135 for more information! Does Federal Autocat have a pick up service for the catalytic converters they buy? Our minimums vary according to location of the catalytic converter collection. Please call 1-800 786-5051 to discuss logistics with Rich at extension 103. Are all emission control catalysts the same? Not at all. Depends on their precious group metal (PGM) washcoat applied at the manufacturer. All emissions control devices contain varying degrees of precious metals including rhodium, palladium and platinum. Brick converters in varying square and round and octagonal shapes used in industrial applications such as rug, coffee, pharmaceutical and power industries contain amounts that far exceed those in an automotive catalytic converter. Not only do PGM loads very according to application but the monolith can be ceramic or metallic, too. The PGM recovery from ceramic monolith and metal monolith differ as well. Does Federal Autocat sell new catalytic converters? You refer to above ground mining in your literature. What does that mean? When recycling precious metals from catalytic converters, Federal Autocat contributes to the above ground collection of precious metals available to industry. As a result, this lessens the demand on our natural resources, reducing the need to mine for non-renewable precious metals below ground. For those of us in the Midwest, do you have a local contact? Andy Cohen is our catalytic converter purchase rep for Ohio, Michigan, Pennsylvania and midwestern states. You can reach him at 248-520-4900. West of the Mississippi, contact Rich at corporate to arrange delivery. 1-800-786-5051, ext 103.